Chvasta's offers a frequent facial program to its customers. Buy 5 facials treatments and get $20 off your 6th facial treatment. Please ask for a card the next time you are in. Chvasta offers $20 off of a facial treatment to any current customer who refers a new customer to us. Please ask for a card(s) the next time you are in. *** Can be used for Facial Treatments Only! 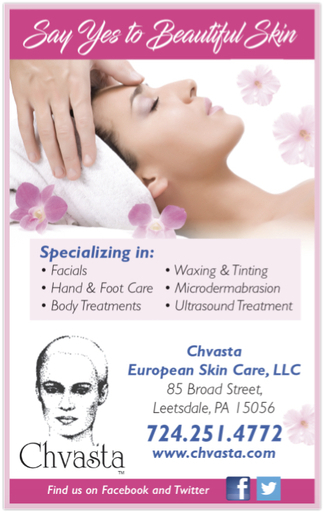 Located in Leetsdale, PA and just minutes away from Sewickley,PA, Chvasta European Skin Care is Pittsburgh's Original European Skin Care Expert. For over 25 years, the staff of Chvasta European Skin Care has been providing top level skin and body care treatments to spa consumers within the Pittsburgh Area. Chvasta European Skin Care is a CIDESCO Certified Beauty Centre and has a CIDESCO Certified Diplomate on staff. We now accept Spa Finder gift cards. If you receive one...please keep us in mind for redemption. Chvasta European Skin Care will accept most versions of SpaFinder gift cards, however, we cannot accept cards with multiple retailers (that include SpaFinder) such as the “Happy Lady” gift card. The gift card must specifically be a SpaFinder gift card. 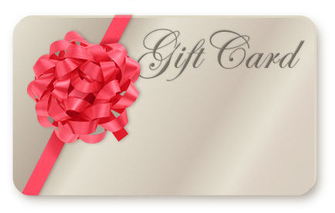 Gift Cards may be picked up at our spa or mailed to you. Please call us at 724.251.4772 or stop in, and we will be happy to assist you. Chvasta European Skin Care uses Hylunia products in their treatments and also retails the products to our spa customers. Hylunia Skin Care uses safe, organic, and natural ingredients. Every ingredient is selected to maximize results and prevent skin conditions by helping your skin repair itself. The products enable people of all ages and skin types to protect, preserve and pamper their skin with powerful anti-oxidants, vitamins and plant peptides.